You may not always be able to see them during your pregnancy, but taking good care of your feet while pregnant can play a large role in minimising discomfort. Here are some of the ways in which pregnancy affects your feet and what measures you can take for each of them. As your tummy becomes larger and heavier, more pressure is placed on the pelvis. This causes swelling in the feet and ankles and may also cause cramping in the legs. Put your feet up as much as possible. Drink plenty of water – this helps to flush away swelling. Avoid foods high in salt that will retain water. Soak swollen, painful feet at the end of the day in cool water. Exercise your calf muscles after standing or sitting for a long time by doing heel raises, as shown below. Hold onto a nearby surface and go up and down onto your tiptoes and back on your heel. As the baby grows, the spine’s curvature is increased, causing a tilt forward of the pelvis. This changes your pattern of standing and walking, placing additional stress on the foot and often pain in the heel, under the arch, or under the ball of the foot. Ice packs under the arch and gentle foot massage can be of help. 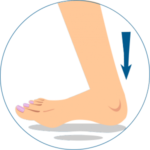 If the pain persists, consult a podiatrist, as you may need custom shoe inserts or orthotics. Hormone changes in pregnancy result in ligament looseness, causing joints to stretch and widen in preparation for giving birth. 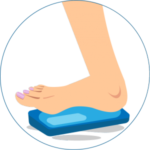 This affects the joints in your feet, often causing stretching and widening of the feet, as well as lowering of the arches. 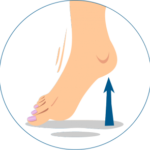 If you experience pain under the arch of your foot, it is recommended that you see a podiatrist. Ask for a pair of Footology Gelonair innersoles for your safety shoes, as they offer more intense cushioning under your feet. Due to hormonal changes, your toenails may grow faster than usual or become brittle or soft. Keep toenails trimmed and apply tissue oil to ease brittleness. Use a soft nail brush to help to promote blood circulation. Due to the changes to your hormones, blood circulation and weight, most women will need to go up a shoe size during pregnancy. About 16% of mothers will permanently need larger size shoes after pregnancy. Make sure your shoes fit well. Shoes that are too narrow or too short will restrict circulation and increase swelling. For some women, increased hormone production can result in bluish, blotchy legs. This temporary discolouration usually disappears after delivery. Your skin is also more sensitive during pregnancy. If you’re going to be driving for longer than half an hour, take a break to stretch your legs to promote circulation. Be sure to use a good sunblock on the tops of your feet when exposing them to the sun. During pregnancy, veins in your body become larger to cope with the increased blood supply. The increased pressure on the veins can cause varicose veins. 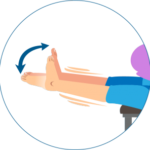 Put your feet up as often as possible to help relieve the pressure on the veins. Walk in flexible flat shoes and sandals. Avoid standing for more than an hour at a time without taking a break. Choose shoes styles with wide, low heels (no higher than 20mm) or low wedge heels. Other measures that you can take to ensure optimal foot health and comfort during pregnancy are choosing the right style of shoe and doing regular foot and leg exercises. Choose a style that has support at the back of the heel – either a closed heel back or a heel strap – for increased stability. Non-skid soles ensure that you are more sure-footed. Comfortable, flatter shoes provide extra support and shock absorption. Point your toes and then pull them toward you as you point the heel away from you. 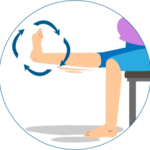 Extend your leg, and rotate your whole foot and ankle in circular motions. This also exercises the calf muscles after standing or sitting for a long time. Lie down and extend your leg. Using your foot, ankle and toe muscles, draw the letters of the alphabet in the air with your foot. Remember to swop over and exercise the other foot and leg. Do capital letters one day and small letters the next. Walk. Walk. Walk. Be sure to use flexible soled shoes with good shock absorption. Swimming and water aerobics are also good for your feet during pregnancy. 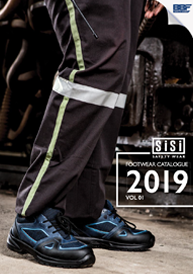 The above information is brought to you by the qualified podiatrist at Sisi Safety wear in the interests of better foot care for women. Sisi Safety Footwear provides a great solution for those who suffer from foot swelling as a result of their pregnancy. The Tyra has a Velcro strap which allows for easy adjustment and padded colour and tongue for extra comfort. 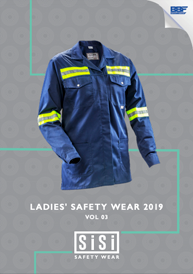 For more information, visit: https://www.sisi.co.za/product/tyra/ and also view the Sisi Workwear Catalogue for our range of Maternity Safety Wear.